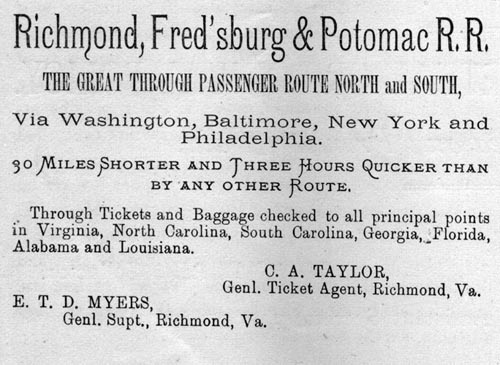 Richmond, Fred'sburg & Potomac R. R., THE GREAT THROUGH PASSENGER ROUTE NORTH and SOUTH, Via Washington, Baltimore, New York and Philadelphia. 30 Miles Shorter and Three Hours Quicker than by ANY OTHER Route. Through Tickets and Baggage checked to all principal points in Virginia, North Carolina, South Carolina, Georgia, Florida, Alabama and Louisiana. C. A. TAYLOR, Genl. Ticket Agent, Richmond, Va., E. T. D. MYERS, Genl. Supt., Richmond, Va.
1. The Insurance Advocate, Vol. IX, No. 3, Richmond, VA., March, 1878, page 42.